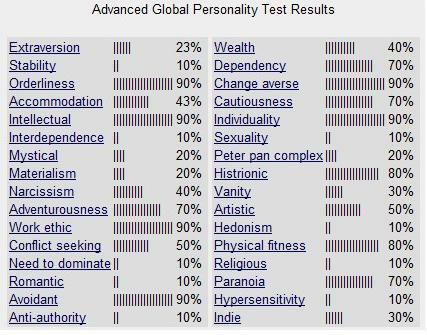 Ha, remember that Global Advanced Personality test that I used to take like twice a year? It’s been like three + years since I last took it. So let’s take it again and compare it to the last time I took it to see how much I’ve changed into a responsible, level-headed adult. Hahaha, my “adventurousness” went up. Livin’ on the edge. Do auditioning court jesters have to provide a portFOOLio? 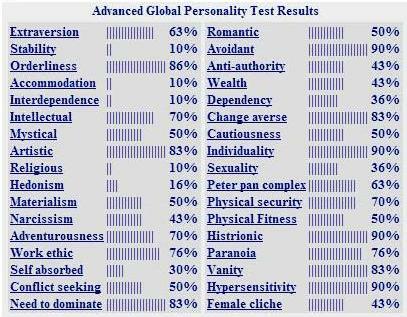 Hey so remember that Advanced Global Personality Test I take like twice a year? Remember how I keep forgetting to do that twice a year? WELL I DID IT NOW NOT THAT ANYBODY CARES HURHURHUR. Are Leibniz’ fingerprints the best of all possible whorls? So remember how I was retaking this test twice a year, once in April and once in September? I think I totally forgot about it for the past two years. But today, for whatever reason, I remembered the test and decided to do it. SO HERE YOU GO. HA I didn’t forget. I thought I would. Hahaha, polarized results much? I’m strange. Hey look, it’s that thing I do bi-yearly. WOO! Was Ockham’s razor a Gillette? Trait snapshot: depressed, introverted, neat, needs things to be extremely clean, observer, perfectionist, not self revealing, does not make friends easily, suspicious, irritable, hates large parties, follows the rules, worrying, does not like to stand out, fragile, phobic, submissive, dislikes leadership, cautious, takes precautions, focuses on hidden motives, good at saving money, solitary, familiar with the dark side of life, hard working, emotionally sensitive, prudent, altruistic. I actually don’t know if this is the right test…it seemed a lot shorter this year. Anyway. Because I’ve done it like 6 times before. The test I do bi-yearly. Mr. Gorbachev, tear the roof off the sucker! It’s that time of the year again! 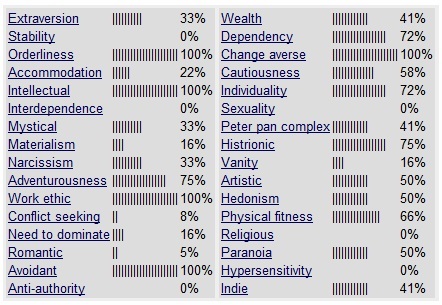 Hooray for retaking personality tests. There’s also my trait snapshot: neat freak, organized, worrying, phobic, fears the unknown, irritable, pessimistic, emotionally sensitive, fears chaos, risk averse, fragile, unadventurous, depressed, frequently second guesses self, perfectionist, hard working, practical, ordinary, cautious, takes precautions, good at saving money, suspicious, mind over heart, busy, altruistic. Progress? Regression? YOU BE THE JUDGE TODAY FOR THE LOW LOW PRICE OF $99.99! Well, it’s that time of the year again. Anything more than twice a year is excessive. I’d do this tomorrow but I don’t want to blog about today. …lies a nut, most likely. The points I agree with: orderliness, stability, intellectual, artistic, religious, work ethic, need to dominate, avoidant, individuality, histrionic, paranoia, vanity, hypersensitivity. The points I disagree with: Anti-authority, sexuality, Peter Pan complex, female cliche (ahem). AND…only 30% self-absorbed? I need to work on that.